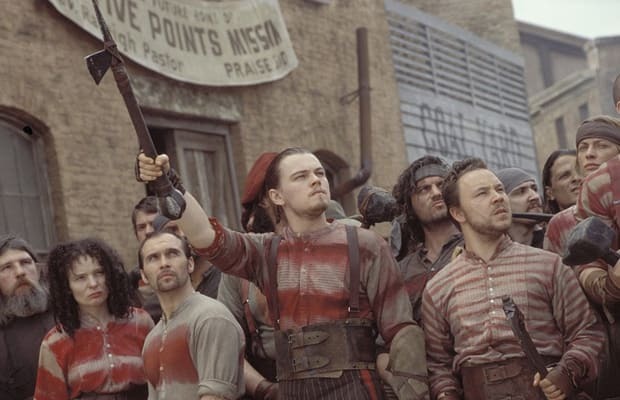 In the pantheon of Martin Scorsese's greatest movies, Gangs Of New York is, admittedly, not even in the top tier, a holy ground occupied by flicks like Raging Bull, Taxi Driver, and Goodfellas. Flawed Scorsese is still infinitely better than most filmmakers' best efforts, though, and Gangs, set against the turf wars that formed the Big Apples in the mid-1800s, has plenty of brilliance to spare. Aside from the stunning sets and costumes, which all received Oscar nominations, Gangs has the benefit of a towering Daniel Day-Lewis performance as crime lord Bill The Butcher, one that's a madcap and frightening precursor to his best-acting-of-the-Complex-era work in 2007's There Will Be Blood.